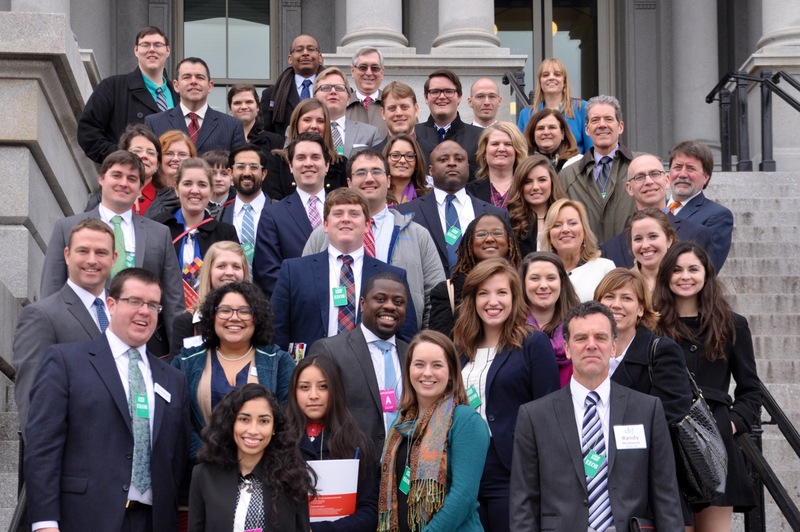 Participants in the 2015 Advocacy in Action Conference. From the backseat of the taxi cab, I ask “where are you from?” “Ethiopia,” he proudly exclaims. We talk about his family who now reside in the United States with him. I ask if he will return to Ethiopia. Shocked at my suggestion he proudly announces that he is a United States citizen and will never return to his homeland. In countless conversations with taxi cab drivers in our nation’s capital, I find a familiar strand of hope laced throughout their journeys. Once, I met a driver who won the lottery to become a United States citizen. Did you know there was such a lottery? One man from Pakistan unashamedly shared his Bible with me which sits on the seat next to him. Another Nigerian taxi driver collected all of his voting stickers and prominently displayed them on his car sun visor. These conversations have shaped my view of my own citizenship while crawling across the busy streets of Washington, D.C., listening to their stories of struggle, peace and providence. On March 9th, I returned to Washington, D.C. for one of the most informational and transformational events of which I have ever taken part as a Christ-follower over the past 26 years (and that is not even counting all those wonderful teenage years). With such an assertion you may be wondering if I do not get out much or if I exaggerate. I do and I don’t. Advocacy in Action, led by Stephen Reeves, CBF Associate Coordinator of Partnerships and Advocacy, is a three-day trek discussing the potential impact that we, the Church, might have on the policies of our nation which directly affect our neighbors whom Christ calls upon us to love in tangible ways. We met with LUCHA Ministries; Bread for the World; Baptist Joint Committee; members or staff of Congress; National Memorial Baptist Church; New Baptist Covenant; Mark Wiggs, CBF Religious Liberty Liaison Counsel; and Melissa Rogers, Special Assistant to the President and Executive Director of the White House Office of Faith-based and Neighborhood Partnerships. I never really thought much of how my voice might matter until last year when I first attended Advocacy in Action. I believed all the political mumbo-jumbo business was up to the elected law makers. I thought of lobbyists as a bunch of large industry suits trying to get a tax break or two. Well, I thought that until last year. Maybe you are like me. I assumed that helping with an occasional food or clothing donation drive and volunteering at the free church meal was the full extent of my impact upon the communities in need which surround me. Only one out of every 20 grocery bags that feed people who are hungry come from church food pantries and other private charities. Federal nutrition programs, from school meals to SNAP, provide the rest. Of the 21.5 million low-income children who receive free or reduced-price lunches, in 2013 only 2.4 million of them were served through the summer food service program. 12 million Americans are trapped every year in a cycle of 400% interest payday loans. If a typical payday loan of $325 is renewed eight times because the borrower cannot pay off the full principal and accumulated interest at each two-week interval due date, the borrower will pay $793 after four months of what they thought would only be a two week debt of $325. Many borrowers are trapped in debt because they cannot pay the principal and interest back within two weeks. One such story is of Patricia, a retiree depending on a limited disability check. She paid over $2,700 in interest plus the principal of $550 in loans over the course of nearly two years. These things matter to me. They matter to me because these facts apply to the people in my city, my state and across my country. They matter to me because I have spent the last year working alongside CBF Together for Hope Ministry Leaders who serve those surviving generational poverty by turning to payday lenders and government nutrition programs. They matter because I know the faces and names of some of these people who make up these statistics. They matter because there are millions more of whom I have never met. They matter because these are my neighbors—every last one of them. This truth reverberates through perspicuous Biblical texts such as Luke 10 where Jesus defines the neighbor as one bestowing mercy upon another who faces insurmountable obstacles. Today, I sing this song back to the millions who are hungry, financially desperate, ensnared by human trafficking, lost in a broken immigration system and facing insurmountable obstacles. Holding on to the important lessons taught at Advocacy in Action, I choose to own my citizenship both as an American and a Christian by making a difference through contacting governmental representatives, supporting organizations and ministries already at work, and maybe by delving into the political mumbo0-jumbo myself and becoming one rowdy neighbor. Jill Hatcher is a grant writer for the Cooperative Baptist Fellowship’s Together for Hope initiative. She and her husband Kirk live in Norman, Okla., where Kirk serves as the Minister of Spiritual Formation at First Baptist Church of Norman, Okla.